On the eve of the National Indigenous Music Awards, national treasure Gurrumul Yunupingu is releasing a new single ‘Maralitja – Crocodile Man” as a tribute to the man he called “wawa” or “brother”, Dr Yunupingu. The song was a favourite of Dr Yunupingu, originally from Yothu Yindi’s multiplatinum album Tribal Voice and will be performed with the original band and Gurrumul this Saturday at the National Indigenous Music Awards. Dr Yunupingu heard Gurrumul’s version last year at the ARIA Hall of Fame inductions, and his family have vetted the release. “The passing of Dr. Yunupingu was significant to Gurrumul, and there is an enormous level of respect there – of what he stood for, the history he has created, and also what they achieved together” said friend and musical collaborator Michael Hohnen. “He loved that man for many reasons but remembers this song ‘Maralitja Man’ or ‘Crocodile Man’ as a sharing of an identity with which they were both born – the identity of the saltwater crocodile”. 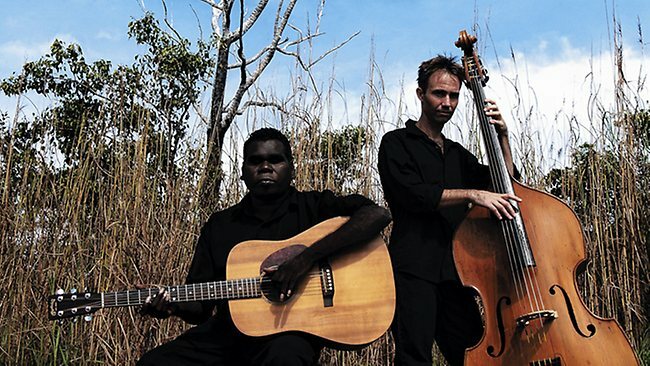 Upon his brother’s passing, Gurrumul released the statement “I respect him….and I love him…. And I miss him”, one of the few times the singer has made a public statement other than via his songs since his journey in music began with his role in Yothu Yindi. The winner of ten previous NIMAs, Gurrumul is pleased to be performing at Saturday’s event where he is also up for National Artist of the Year. He also holds two nominations for Song of the Year for his collaboration with Yolanda Be Cool and Flume on “A Baru In New York” and his stunning duet with Delta Goodrem “Bayini” which he performed earlier this year on The Voice, topping the iTunes charts and becoming the first Indigenous language release to hit the ARIA top five singles. Gurrumul is also nominated for Act of the Year at the 2013 Deadly Awards to be held at the Sydney Opera House this September. theaussieword.com caught up with Gurrumul’s friend and musical collaborator Michael Hohnen! How does Gurrumul feel to be able to release this tribute for Dr Yunupingu? This release is a great opportunity to pay respect to a man and a big part of Gurrumul’s life that gave him so much. Yothu Yindi was Gurrumul’s apprenticeship into the industry, and this song was a big part of that journey. It has been a great year for Gurrumul, what does it mean to be nominated for Act of the Year at the 2013 Deadly Awards? Recognition within one’s own group is a very heartening and affirming moment for Gurrumul. To take that to a national level, and in the Sydney arena he feels that it is extended beyond what he really expects in some ways. He revels in the fact that this nomination has come in and that people who vote in The Deadlys from around Australia think as much of him as his family in his community in NE Arnhem Land. Does Gurrumul have any exciting projects coming up for 2014? Yes. Many, but one we have started premiering is his 3rd album. We don’t yet have a release date but it will be along the lines of some of the new works we recently performed at VIVID Sydney as part of the Gurrumul – His Life and Music concert series with the orchestra. They are explorations into traditional song, harmonised and orchestrally arranged. AWAYE just played a couple of the pieces live for their 21st birthday celebrations, and we are doing some more live versions soon. Maralitja ‘Crocodile Man’ is available on iTunes! Next PostForeigner & Europe UK Tour!